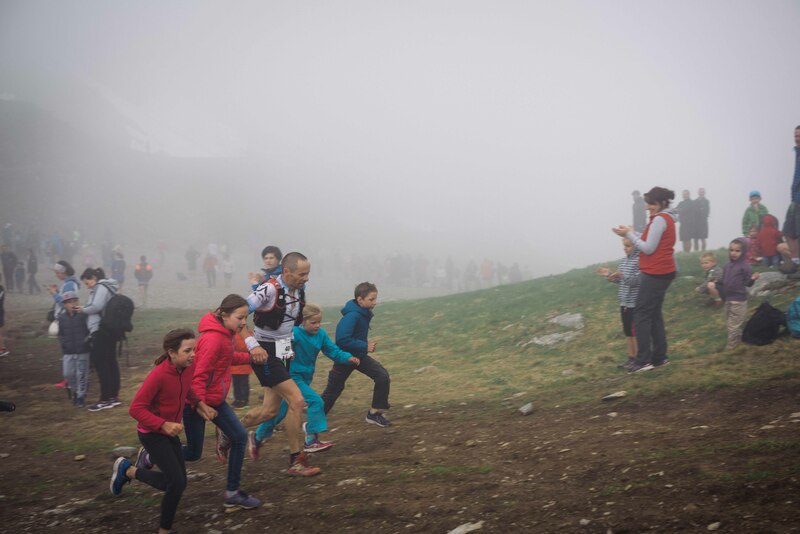 Less than a week after finishing the Jukolan Viesti orienteering relay (see the race report here), I was sitting on a plane to France for attending my first ever mountain running race. 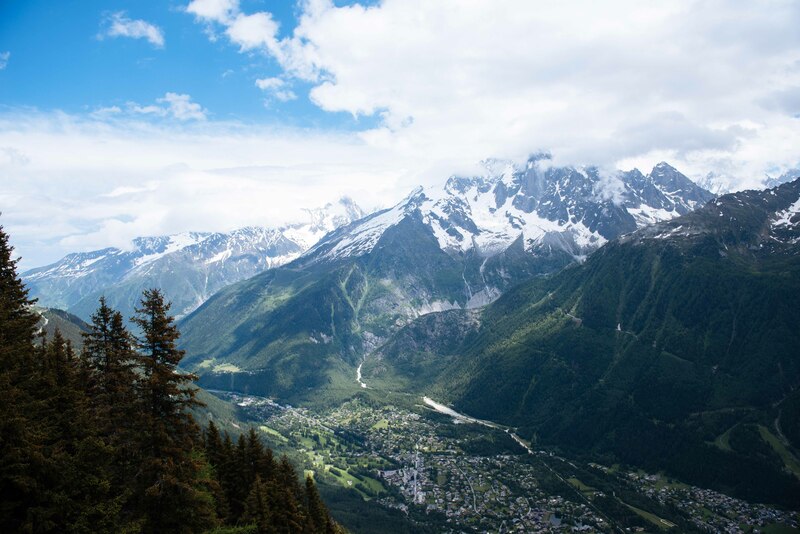 Marathon du Mont Blanc takes place in Chamonix and includes six events ranging from vertical kilometer to 80k ultra. The town was full of life with more than 7000 participants representing 65 nationalities and the locals were happy to join the fun. My race wasn´t up until Sunday so I had plenty of time to peek at the surrounding mountains trying to figure out which one I´d need to scale before the weekend was over. I was expecting a long day at the office so I made sure to keep my calorie intake up by regularly visiting the legendary Poco Loco hamburger joint at the heart of Chamonix. The 80k race was up first starting at 4AM Saturday morning. Runners had full 24h to finish the course including roughly 8000m of elevation. Finish line was located in Chamonix and by the time the winner was expected to arrive, temperature had climbed up to +35c. It was unbearably hot just standing there waiting in the sun and I couldn´t even imagine how the 80k runners were feeling making their way through the mountains in that kind of heat. Suddenly, the mobile phones were lifted up, music became louder and the 80k winner, Diego Pazos, danced his way through the streets of Chamonix lined by spectators. He crossed the finish line with an incredible time of 10:52 looking fresh as ever! 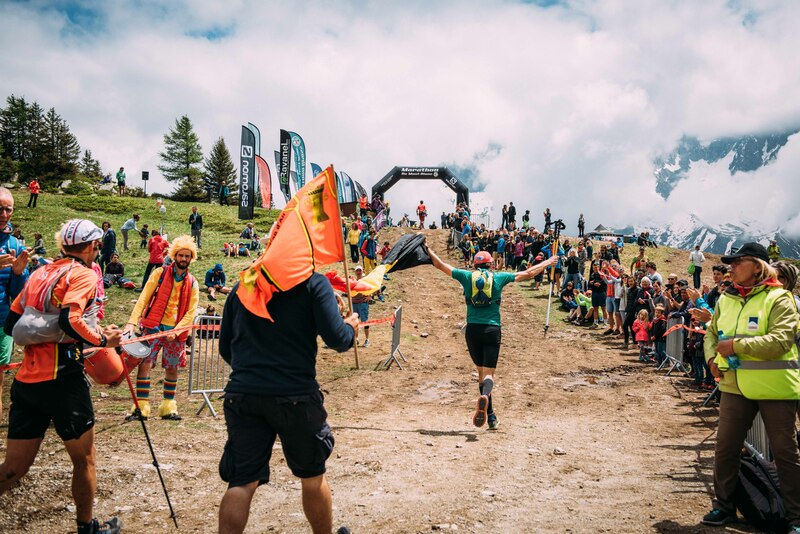 Through the evening and the following night, the 80k runners kept arriving to Chamonix one by one slowly crossing the town accompanied by cheers and well-wishes. Our quiet dinner in a late night pizzeria was interrupted by an impromptu standing ovation when a guy with a “difficult walk” stepped in for some calories after a long day out. The gesture made me a bit emotional and I needed to look away while he was kindly directed to sit down at the closest table – this town really knows what it takes and appreciates the determination! I had signed up for the 42k race starting 7AM on Sunday morning. The route included a bit less than 3k of elevation finishing up at a summit facing Mont Blanc. My preparation had been less than optimal with lower than average running volume and skipped hill repeats due to a nagging knee injury since Rovaniemi 150 arctic winter race in February (see the race report here). I was fairly confident with my climbing but seriously doubted how my legs could take the long downhills with such little training. On the night before the race I don´t remember sleeping much. When my alarm went off at 4:30AM, I dragged myself to an armchair next to a window facing Mont Blanc, and started munching through my packed breakfast staring at the quiet mountain. At 6AM, the race center was starting to wake up. I dropped off my after-race bag and hurried to secure my place at the start line. Most of the 2700 participants were already up well before the start and race tension was building up. Spectators had lined up by the streets, music was playing and the final race instructions were given in both French and English. A couple minutes before the start, the rope separating pro´s and the rest of us was removed – we all took a couple steps ahead and knew this was it. Final words from the race director were followed by big cheers at 6:59 – one minute to start! With the sounds of AC/DC´s Hells Bells playing in the background, I found myself running through the crowd-packed streets of Chamonix with emotions varying from sobbing to open laughter. 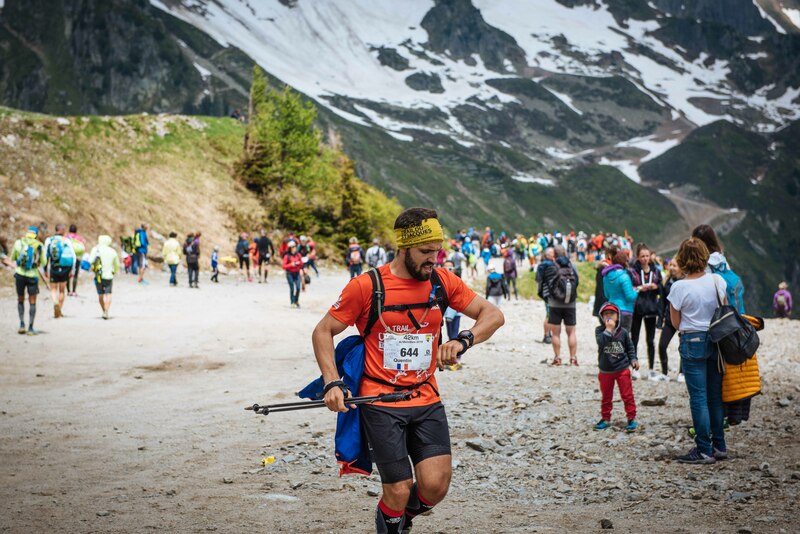 Months of worrying about the knee injury and continuous uncertainty of whether I´d be able to start this race in the first place – it was all in the past and I was actually on my way towards Mont Blanc Marathon finish line! First kilometers were easy running with slight uphill at 5:10 – 5:20 pace. I made sure to keep my heart rate in control and run my own race regardless of the people passing me by from left and right. After an hour of running we crossed the first checkpoint and with the familiar “beep” I knew my loved ones were getting the 1st update on my progress. The first aid station was packed with people and I decided to just run through. I was carrying my own energy for the whole race and my water bladder was still comfortably full. With hundreds of people left behind queuing at the aid station there was more room for running. The trail turned to a slight downhill and I was moving at roughly 5min pace. The progress felt almost too easy. First real climb started at around 20k. As the trail turned steeply upwards, our pace dropped down to speed hiking. I took the opportunity to fuel up and munched through an extra energy bar on top of my regular “gel every 30mins” routine. I found myself to be a decent climber and quickly caught up with the runners who had passed me on the downhill a bit earlier. We marched upwards in one hard-breathing quiet queue. On the lower slopes, the forest shielded us from the sun, but once we approached the open upper hills, the heat started to wear us down. We had already been climbing for 45mins and there was no end in sight. I was starting to regret my last minute decision of leaving my poles in hotel room as my legs could have used all the help available. Finally, after more than an hour of climbing, we started hearing music from the distance. The long-awaited aid station was within reach! I´ve never enjoyed seeing a bottle of Coke as much as I did when I spotted one at the aid station table. I quickly grabbed the “mandatory personal cup” from my backpack and filled it up. I felt a surge of energy pass through me while I was already pouring another one. After filling up my water bladder, thanking the volunteers, and cheering for the lonely rock star on mountain, I felt more than ready to go on and continued heading upwards. Clouds were again starting to gather and the weather at the top was nicely cool. At times, we were passing patches of snow and the rocks were getting wet and slippery – I new we´d be facing a tricky downhill shortly. When approaching the summit, the trail turned even more technical. There were sections where we were forced to rely on the good old “four wheel drive” to climb on the cliffs blocking the trail. When the trail finally turned downwards, I was elated to pick up the pace again. More experienced mountain runners quickly vanished behind the cliffs while I was trying to get my legs used to the idea of going downwards for a change. My enthusiasm of the downhill quickly died down when I realized the wet technical trail combined with my tired legs was a recipe for disaster. To avoid seriously falling face-down in my first mountain running race I decided to take it easy and make sure to save my legs for the long race ahead. Finding my downhill legs after the long climb took a while, but eventually the running started to feel somewhat natural considering I was starting to approach 4 hours on the trail and had already covered roughly 1500m of elevation. We scrambled downhill through the clouds in a long queue. Slowly, the rocky terrain changed to forest paths and I knew we were approaching the valley. After an endless row of twists and turns through the forest and a couple of good kicks on a root (toenail still blackened but intact!) we finally arrived to the next aid station. “Beep” – update to the family, fill up the water bladder, and I was off for yet another climb. 30k done and I felt like I was already approaching the finish line! As the longest downhill was now behind me, I was becoming more confident on my ability to finish the race in a decent shape. I decided to keep the pace brisk on uphills and was constantly passing others while trying not to get eye-popped by their poles. On the other hand, I made sure to save my knees on the downhills to avoid extensive pounding on my recently injured knee. At around 35k the trail turned upwards again and I new it was time for the final climb. It was sunny down in the valley and the temperature started rising. On the mountainside we were shielded from the wind and the climbing got really hot. I kept cooling myself by wetting my cap in each mountain stream we passed along the way. Due to the heat, I must have been drinking more than normally, as after a while of climbing I realized my water bladder was all empty! 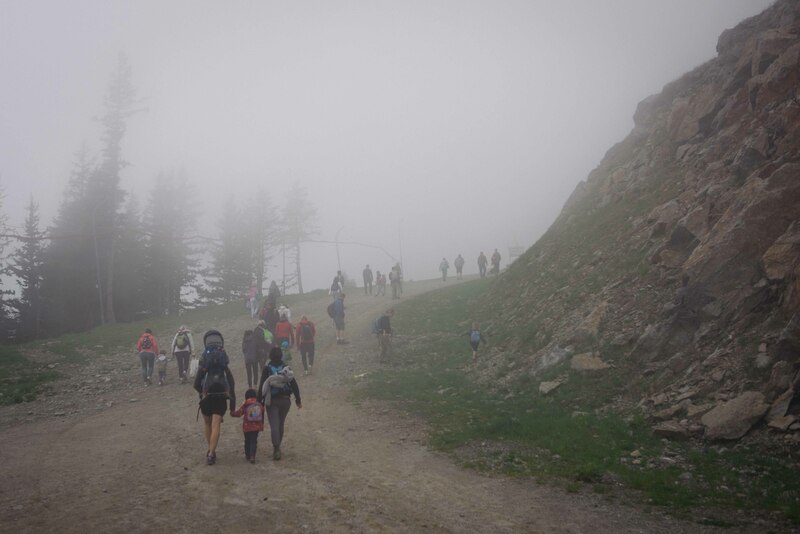 Number of possible scenarios run through my mind – I new we still had at least another hour to go to the finish line at the summit (turned out to be 1,5h) and I cursed myself for not checking the exact locations of the aid stations. I played with the idea of asking for water from some of the other competitors or drinking from the streams. Luckily, the air was getting cooler again as we got further up the mountain and I was somewhat able to manage with my thirst. I tried keeping the energy intake up with gels, but without water, my stomach seemed to reject them and I was slowly starting to run out of energy. After another half an hour of climbing I finally heard some music ahead and shortly after, to my relief, saw some tents with Salomon signs on top! Before even thinking of anything else, I charged towards the closest Coca Cola bottle and downed 3 cups just to get some fluids and energy in as fast as possible. The sugar worked miracles and after re-fueling my water bladder, giving thumbs up to the local musician and high-fiving the aid station worker at the checkpoint (beep – another update to family) I was off for the last leg towards the finish line! The final leg was one of the most beautiful parts of the course. The trail veered on the mountainside slowly inching upwards and the mighty Mont Blanc was looming on the other side of the valley. After more than 5 hours of running, my legs were staring to ache at each step. Each small descend needed to be managed with care and crossing the technical rocky sections required yedi-class concentration. Eventually, my GPS was signaling the 41th kilometer had been covered, and I was mentally starting to prepare myself for shortly crossing the finish line. I picked up the pace, tried to look as fresh as humanly possible after close to 6 hours of running, and tried to peer around each corner to get a glimpse of the finish. Finally, at 41,5k, I started hearing loud music and cheers, but was puzzled as there was no finish line in sight. The trail seemed to go on along the mountain side and then turn upwards and…oh – it was all the way up there? It took me a good while to get my head back from the immediate expectation of finishing the race to facing yet another climb. It appeared that instead of 42k, the race distance was somewhere closer to 43,5k, and the last remaining 1,5k made a steep 200m climb to the summit. I put my head down and started marching. Both sides of the trail were filled by spectators cheering the climbers upwards. After another long 15 minutes of climbing I eventually made it up to the final stretch. I pulled together all my remaining energy and pushed myself to run the remaining 300m hill finally crossing the finish line with a tired but happy smile on my face! Lingering at the finish line, enjoying the buffet, and watching other runners finishing their days work – I forgot about the time and just let the accomplishment slowly sink in. Regardless of the seriously sore and tired legs, I felt no “unnatural” pains so I was somewhat sure my injured knee had held it together through the race. While downing countless mugs of Coke, stuffing myself with fruit cakes and enjoying the atmosphere, I found myself already thinking of my next 50k race in three weeks. It´s really hard to get better than this one! Out of the 2643 participants I ended up finishing 350th (top 13%) making my way up the rankings as the race progressed. Considering the lowered amount of training I´m very happy with the result and actually surprised I was able to pull that off! When looking at the elevation profile I kind of get the picture why my troubles started at around 35k. Legs half dead from long downhills combined with the lack of energy and water on the final climb took out the best of me and from then on it was pretty much surviving. And above all – I really need to do some serious work on my downhill running before longer mountain races. Lucky the finish line was at the top this time – I wouldn´t have been able to make it back down to Chamonix. One happy camper heading home from France – next up North Face Endurance Challenge 50k in Canada in three weeks!